Tips and recipes for a memorable Valentine’s Day. This Valentine’s Day, serve a meal you’ll both love. 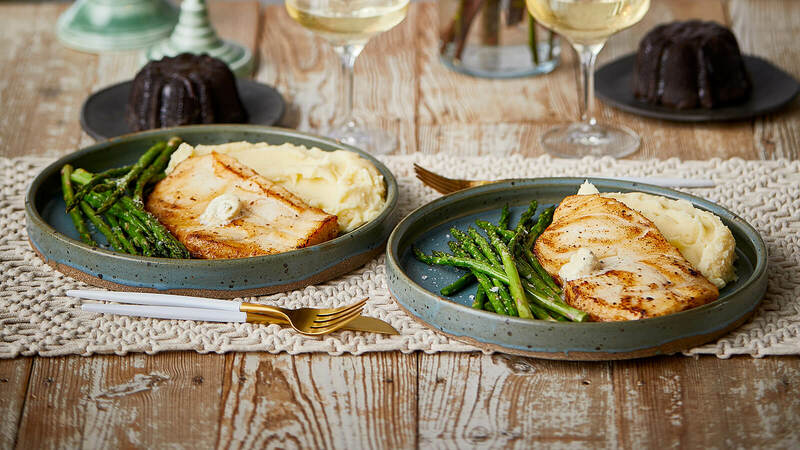 We make it easy to impress your sweetheart with a filling, flavorful meal for two. Whichever combination of entrees you choose, here are a few simple tips to ensure your Valentine’s Day meal runs smoothly. Remove steaks from the refrigerator at least 30 minutes before cooking to bring them to room temperature. Keep your lobster tails and Chilean sea bass refrigerated until you're ready to prepare them for cooking. Make sure the lobster tails are fully thawed. 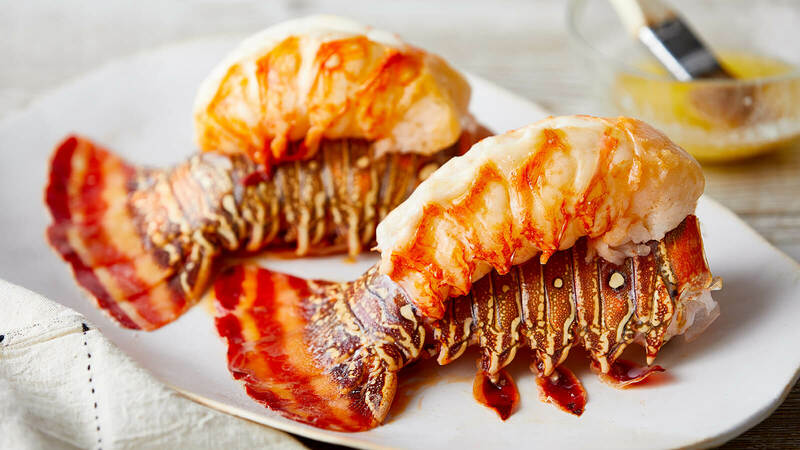 If you need to thaw them quickly, seal the lobster tails in a plastic bag and submerge in cold water for several minutes. We’ve included options for reheating your potatoes in the oven or microwave. If you are tight on oven space, opt for the quicker microwave method. Don't forget the wine! If you're serving our Chilean Sea Bass or Warm Water Lobster Tail, we recommend Gerard Bertrand Cote des Roses Rosé, which tastes as beautiful as it looks, with a gorgeous bouquet of summer fruits and floral notes that give way to a fresh finish. 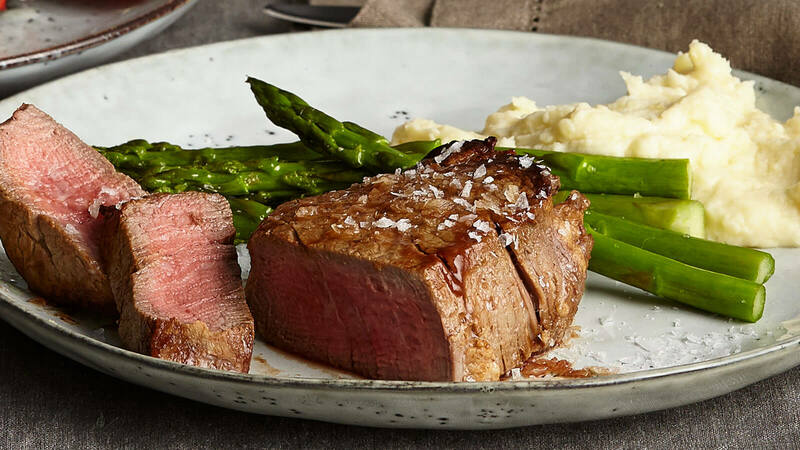 If you opt for our USDA Prime Chateaubriand Filet Mignon, we recommend a deep, dark red wine, like Simi Landslide Cabernet Sauvignon, which is bursting with intense flavors of black cherry, cassis and spices. Pat steaks dry with paper towels, then rub each with ½ tbsp olive oil and season to taste with salt and pepper. Heat cast iron skillet over medium high. Place steaks in pan and sear for 1-2 minutes. Turn steaks, top each with 1 pat of Garlic Parm Medlee Seasoned Butter and transfer the skillet to oven for 7-10 minutes, or until internal temperature reaches 130°F for medium rare. Remove to plate and rest 5-10 minutes. To serve, pour remaining butter from pan over steaks. Pat fish dry with paper towels, then rub with ½ tbsp olive oil and season to taste with salt and pepper. Heat a non-stick skillet over medium high. Gently place fish in pan and sear until a nice brown crust develops, about 5-7 minutes. Gently flip, top each with 1 pat of Garlic Parm Medlee Seasoned Butter and sear other side for an additional 5-7 minutes or until fish is cooked through and flakes easily. To serve, remove to a plate and pour remaining butter from pan over fish. Place lobster tail on cutting board. Using kitchen shears, trim down the center of the shell cutting towards the tail. Once you reach the tail, make a perpendicular cut from end to end to form a “T.” Using a paring knife, gently loosen the meat from the shell. Using your hands, crack open the shell slightly. Lift lobster meat out of shell and rest it on top of shell, leaving the meat connected at base of tail. Place lobster tail on baking sheet. Brush with melted Garlic Parm Medlee Seasoned Butter and season to taste with salt and pepper. Roast at 450°F for 10 minutes, keeping a close watch to avoid overcooking. Lobster is done when the internal temperature reaches 145°F and meat is pink and opaque. For a full, step-by-step guide with photos, click here. Preheat oven to 400°F. 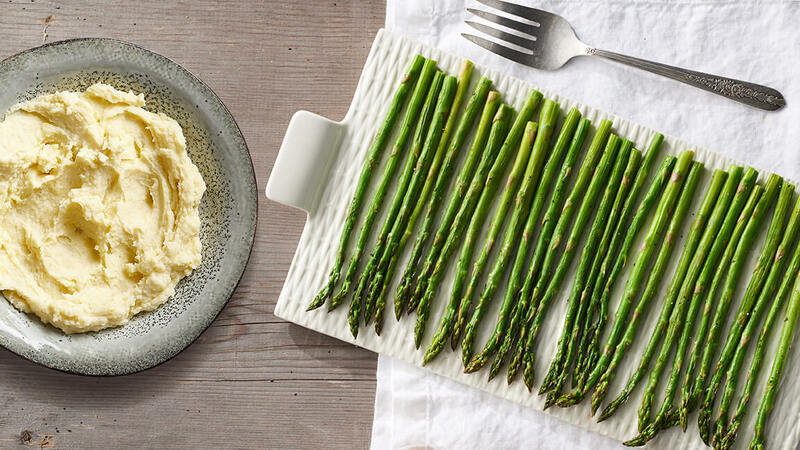 Place asparagus on sheet pan. Drizzle with 2 tbsp olive oil, season to taste with salt and pepper and toss to coat. Bake for 12 minutes or until tender. Finish the asparagus with fresh lemon zest and a squeeze of lemon juice. Preheat oven to 350°F. Remove from original container and place in an oven-safe dish. Cover dish and bake for 35-40 minutes or until internal temperature is 165°F. Or, place in a microwavable container, cover and heat for 6-8 minutes or until internal temperature of 165°F is reached, stirring halfway through cook time.